Welcome to the Tetiev/Tetiyev KehilaLinks page. Tetiev is the form of the name most commonly used by those who lived there and who emigrated, as well as many of their descendants. It is often (though not invariably) pronounced Tet-eev, in two syllables. Tetiyev is the local official name form approved for use within the US Government by the US Board of Geographic Names (US BGN), and represents the more Russian pronunciation. Tetiev-Tetijev-Tetiyev-Tetievo-Tetiewo-Tetiyiv-Tetiew-Tatiew-Tetiw-Tetyiow (Polish)-Titeyow-Titejov-TeTiïb/TETIÏB (Cyrillic). When using JewishGen's databases such as the JewishGen Family Finder , as well as Internet search engines, be sure to check all spellings. Misspellings (on passenger manifests and elsewhere) include Tetico. Other variants and misspellings can be seen in the passenger manifests that recorded the arrival of Tetiever emigrants. All of the original names are of course spelled with the Cyrillic alphabet, used by both the Ukrainian and Russian languages. The names in the following table are, and have been transliterated quite a few ways over the years, and there are no absolutely correct variants. Be prepared to see almost any Ukrainian place-name spelled several ways in the Latin alphabet, or in English, as you consult various sources of information. 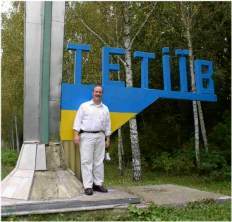 Tetiev is a small town located about 70 miles south-southwest of Kiev. The largest nearby city is Belaya Tserkov, about halfway up the road to Kiev. Time Zone-Same as Moscow-3 hours earlier than Greenwich Mean Time. Relative to the U.S.A., Tetiev is 8 hours earlier than New York most of the year; 9 hours earlier from April 1 to the fourth Sunday of April and 7 hours earlier from October 1 to the fourth Sunday of October. Place names are per US Bureau of Geographic Names (US BGN). Click on any of the following links to view maps. Then click your browser's "Back" button to return to this page. Tetiev Street Map Not yet available. Our photo collection has begun. 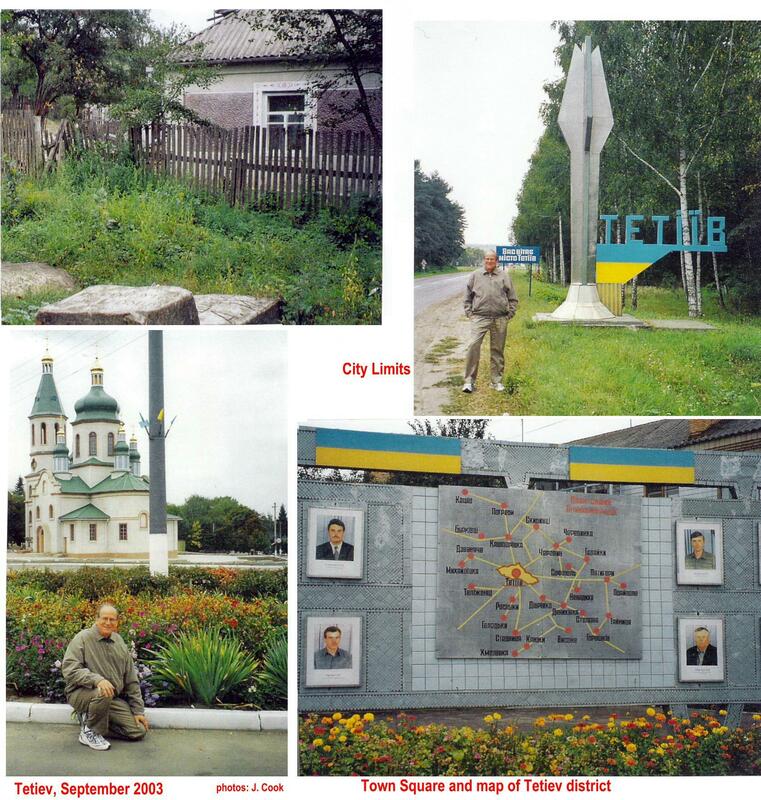 See Jerry Cook's four general views of Tetiev and three Tetiev cemetery views taken in September 2003. Gregg Rickman visited Tetiev in September 2006. 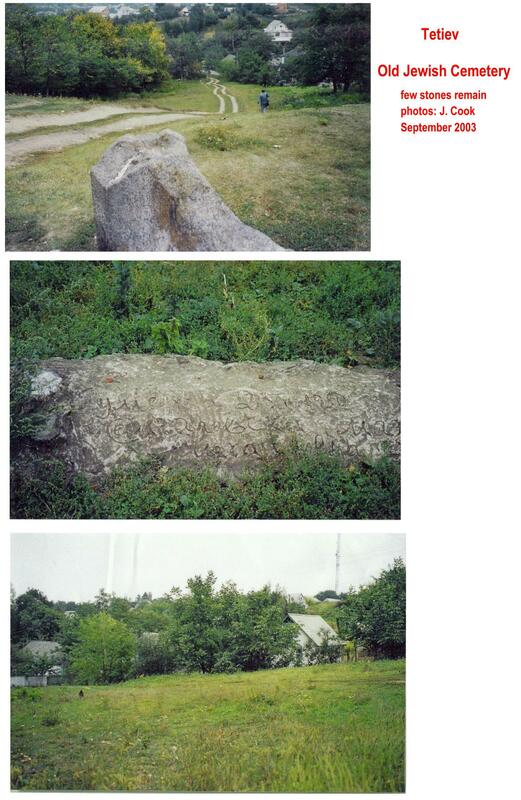 Here are some of his photos of a gravestone, a bucolic scene, and himself. We are also posting images of two nearby synagogues to show what the building in Tetiev might have looked like. History Some history of Tetiev going back centuries is in Ukrainian and must be translated. Here is an opportunity to share with others some of the stories that emigrants have told. 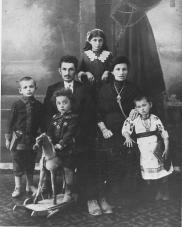 Read Fred Geyzer's oral history (998 KB) of his early life in Tetiev and his escape finally to the U.S. Read David Spevack's story of separation, the pogrom of 1920, and reuniting with his father (who had emigrated) after ten years. Extensive family trees are not allowed in KehilaLinks pages and should be added to the FTJP (Family Tree of the Jewish People" project. However, short Family Trees and narrative Family Biographies are welcome. It is always nice to read about a family, what they did for a living and, of course, who they married, their children, parents, in -laws, dates of events, etc. as long as this is displayed in a narrative form. Famous people born in Tetiev or descended from Tetievers. Phil Spitalny (1890-1970) orchestra leader, noted as the leader of Phil Spitalny's All-Girl Orchestra..... Yoselle [Josef] Rosenblatt (1882-1933) was probably the most famous cantor of all time. His recordings were used for the first talking movie-The Jazz Singer. His grandfather was from the Tetiev suburbs..... Lee Rich ( - ) founded Lorimar Productions (the Waltons, Dallas, etc. ), was CEO of GM/United Artists, and is an Executive Producer for Warner Brothers (e.g., Moonstruck)..... Hershel Orland ( - ) who stayed in Russia, was a famous Russian poet. Tetiever Khurbn-The Destruction of Tetiev [1919-1920] A detailed history of the total destruction of the town and of three-quarters of its population. The Massacres of Tetiev  Two additional detailed reports of the total destruction in late March 1920. These links bring you to information about cemeteries or burial sites that are associated with Tetiev or Tetiyev. However, not all burials in these cemeteries are of Tetievers or their descendants. Tetiev--- The Tetiev cemetery is described and shown in several photographs; also here as well as on this web site. New York--- Beth David (Elmont, Nassau County). No detailed information available at this time. There is a memorial to the 1919-1920 pogrom in Tetiev. Here is a preliminary List of Associations related to Tetiev. The first link allows you to search the database for any entry that mentions Tetiyev/Tetiev. The second link allows search of the database for other towns and surnames. The JewishGen Ukraine Database is a multiple-database search facility that incorporates the databases containing over one million entries on individuals living in the area that is now Ukraine. These databases have been contributed by the JewishGen Ukraine SIG and individual donors. They include all of the following databases: JewishGen Family Finder (JGFF), JewishGen Online Worldwide Burial Registry (JOWBR), JewishGen Holocaust Database, Vsia Rossiia Business Directories and much more! The database is a work in progress and new entries are being added regularly. Click the button to show all entries for Tetiev in the JewishGen LUkraine Database. Death Lists-Some information, particularly death lists, is not generally available and is hard to come by. Stephen N. Roth has compiled an index of the surnames that appear on a Tetiev master death list for 1919-1920 that can be consulted here. See the attached Index to Tetiev Death Lists. for the 1919-1920 pogroms. Cleveland Cemeteries- Our first project, already completed by Terry Lasky, was to computerize extensive information on burials in Cleveland. Tetiever Surnames--Nathen Gabriel has assembled a Tetiever Surnames List from various databases. We invite others will come forward with both project ideas and as volunteers.